Apparently for Turkey's extremist Muslims, this is a war between "us good Muslims" and "those infidels." First, Turkey is running a military show in Arab Syria: targeting Muslim Kurds who it claims are terrorists. Erdogan has vowed that after Syria, the military campaign will target northern Iraq. In the meantime, Erdogan's "Arab friends" are showing signs of hostility, one after the other. The events in the last couple of weeks seem to confirm that Turkish President Recep Tayyip Erdogan's ambitions for a Turkey-led ummah (Muslim community) are not welcome in the Arab world. This emerging divide among Sunni Islamists -- Turkey, Saudi Arabia et al -- is important for the West. In Turkey, a hysteria has set in. It appears a national competition of patriotism has captured the Turkish imagination. Screams of martyrdom and jihad can be heard echoing across the country. Even children are not spared from the ugly "death talk." There is a story behind this jihadist euphoria. 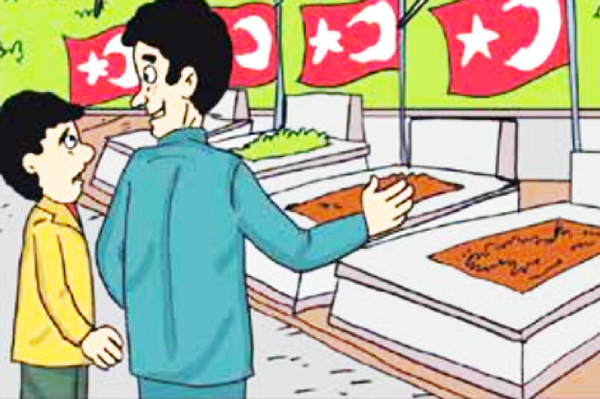 In 2016, Turkey's Religious Affairs General Directorate (Diyanet), the ultimate religious authority in the country, issued comic books to the nation's children telling them how glorious it is to become an Islamic martyr. One cartoon was a dialogue between a father and his son. "How marvelous it is to become a martyr," the father says. Unconvinced, the son asks: "Would anyone want to become a martyr?" "Yes" the father replies, "one would. Who doesn't want to win heaven?" In 2016, Turkey's Religious Affairs General Directorate (Diyanet), the ultimate official religious authority in the country, issued comic books to the nation's children telling them how marvelous it is to become an Islamic martyr. 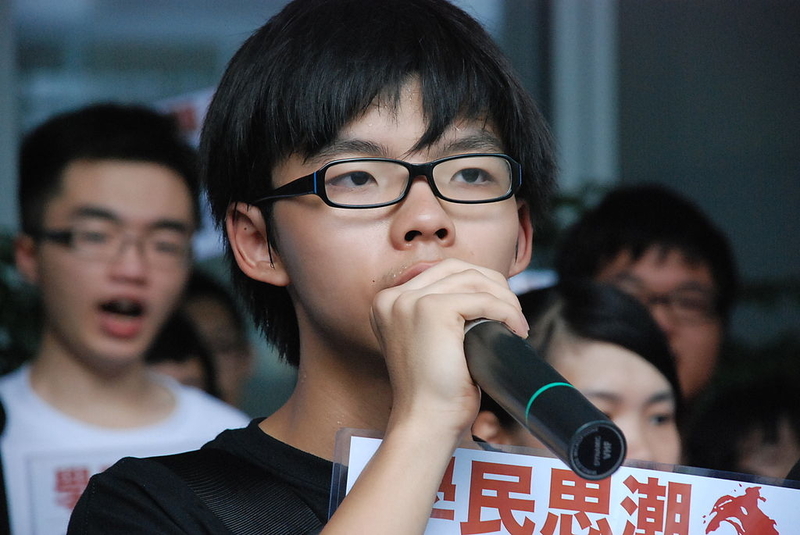 Students, including kindergarteners, have been asked to conduct military marches and recite ultranationalist poems at schools . Some state schools have replaced their recess bells with Ottoman military marches. In a recent political show, President Recep Tayyip Erdogan, at a party congress, spotted a weeping six-year-old girl in a military uniform. He brought her onto the stage to tell her that if she died as a martyr, her coffin would be covered with the Turkish flag she held in her pocket. "You are ready for anything, aren't you?" Erdogan asked. The terrified child, through her sobs, hardly managed to utter "yes." Erdogan's Islamist militarism, in a nation that lost an empire a century ago, still finds millions of followers. At another party congress on March 11, thousands of fans in blue commando berets greeted Erdogan. The president lamented the loss of the Ottoman Empire: "Our (Turkey's) land is 780,000 square kilometres. We came down to this from 18 million square kilometres". "Take us to Afrin," the crowd said to Erdogan, referring to the Kurdish enclave in northern Syria, now the target of a vicious Turkish military campaign. Parliament Speaker İsmail Kahraman, one of Erdogan's oldest political allies, had declared a jihad against the Syrian Kurds. "Look, we are now in Afrin. We are a big country. Without jihad, there can be no progress," Kahraman said on Jan. 29, nine days after the Turkish military started its "Operation Olive Branch". Apparently for Turkey's extremist Muslims, this is a war between "us good Muslims" and "those infidels." All the same, the Middle East is more complicated than Erdogan thinks it is. Erdogan's powerful Islamist ideology has prompted him to reverse the prevailing anti-Arab stereotypes in the Turkish society. While the Arabs are proud of their revolt against the Ottoman Empire in alliance with Western powers at the beginning of the 20th century, Erdogan claimed that "Arabs stabbed us in the back was a lie". The reality is much different than what Erdogan wishes to believe. In the meantime, Erdogan's "Arab friends" are showing signs of hostility, one after the other. Amid growing tensions between Turkey and Egypt, Egyptian authorities are revising street names in Cairo in view of calls to change historical Ottoman-era street names. The move came after an Egyptian academic branded the Ottoman rulers "colonizers" and a street named after Ottoman Sultan Selim I was changed. Cairo's deputy governor, Mohamed Ayman, said: "It is totally illogical that our streets be called after Ottoman figures when our country has people who deserve this honor much more". In recent weeks, public and social media initiatives in Egypt began calling on consumers to stop buying Turkish products. At the beginning of March, the Dubai-based, Saudi-owned MBC, the largest private media network in the Middle East, decided to ban popular Arabic-dubbed Turkish television series' from all channels. The Arab blow to Turkish drama had an explanation. Saudi Arabia's crown prince, Mohammed bin Salman bin Abdulaziz Al Saud, created a new "axis of evil" identifying his country's top three enemies: Iran, Turkey and Islamic militant groups including Hamas and the Muslim Brotherhood, both of which Erdogan embraces. Salman is now the Kingdom's top diplomat, defense minister and heir to the crown. "It is no secret that Arab-Turkish relations aren't in their best state. In order to return to balance, Ankara has to respect Arab sovereignty and deal with its neighbors with wisdom and rationality". There is more than enough evidence that Erdogan should take into consideration if he intends to enjoy his fake love affairs with his Arab neighbors. But his ambitions to make Turkey leader of the ummah seem to have blinded him. Unfortunately, there is little evidence he will adopt reason instead of regional bullying. "Erdogan has taken the Pakistani formula of mixing hard-line nationalism with religiosity. Zia imposed Islamic laws by decree, amended the constitution, marginalized secular scholars and leaders, and created institutions for Islamization that have outlasted him. Erdoğan is trying to do the same in Turkey." It seems to me that Turkey has aligned itself with ISIS. Turkey wants to re-establish the Ottoman Empire with the attacks on Greece. ISIS wants to establish an international caliphate. If they come together heaven help us because heaven will be the only one who can. It is long past time to marginalize this little tyrant wanna-be! Perhaps this hero of ghosts long past will do us a favor, and go win heaven by becoming a martyr against Kurdistan! In any event, it is time to remove our American assets, and remove Turkey from NATO. Erdogan's delusions of grandeur and military adventurism are going to be a source of continuous trouble, and maybe a major war. He could be slapped down and put back in his box by destroying any troops he sends beyond his borders, but those who could do it are too divided and/or lack the will. He's likely to cause a great deal of turmoil in the region, and gain enough strength to make putting him down a major undertaking, before he generates a real opposition. We really live in interesting times. It remains to be seen whether Erdogan's dreams and ambitions of becoming Caliph of Dar-Al Islam will become reality in the next few years! Another great article by Burak Bekdil. My how the mighty are fallen. Turkey used to be such a wonderful place for Jews and Israelis. I visited almost 80 times in the period Apr. 1995 - May 2010 [before the Mavi Marmara idiocy by Erdogan], always with a kipa on my head, and always wonderfully welcomed and catered to. Sad that a once great country has descended to the level of a 'sh*thole' country.